Qatar is situated to the east of Saudi Arabia. Roughly the combined size of counties Cork and Clare (11,437km2), it is a piece of peninsula that is virtually uninhabitable in summer when temperatures oscillate between 40 and 50 degrees. But this emirate has has bought a majority stake in Paris St-Germain football club, it has intervened militarily on the side of the Western powers during the Libyan Civil War and it will host the FIFA World Cup in 2022. 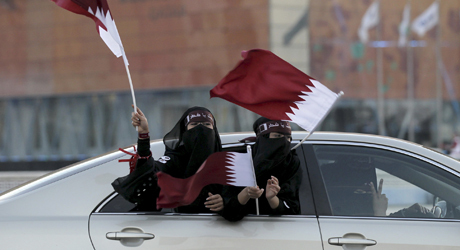 Qatar achieved its independence in 1971. It has a population of 1.5 million, of which only 200,000 are actually Qatari. Their revenue per head of population is quite simply the highest on the planet. They pay no tax, have free health-care and public transport systems and, for the most part, don’t even have to work (that’s left to the immigrant labour force). Their enormous wealth comes from under the ground and under the sea – in the form of oil and, more importantly, of natural gas. The country is the worlds third-highest producer of the latter. This allows Qatar to manage the largest sovereign fund on the planet – QIA (Qatari Investment Authority), whose combined assets are worth around 700 billion dollars. Qataris are rich at birth and then soon become worried. Their national obsession is to preserve and protect what they have: that is to say the independence and the very existence of a feudal state that is governed by an emir who changes according to the latest coup d’etat. The last one was in June 1995. It allowed the current emir – Hamad bin Khalifa al-Thani – to depose his father, who was holidaying in Switzerland at the time and who, in turn kicked his cousin out of the palace in his own coup d’etat in February 1972. There was almost another one in July 2009 but it failed. Survival being its permanent preoccupation, Qatar is ceaselessly seeking allies, friends who owe them a favour and recognition in all its forms: diplomatic economic, financial and… sporting. Qatar is the advisor, the financier, the partner and the intermediary of almost the entire world: of the USA and of Israel, of Saudi Arabia and of Iran, of the Palestinian Authority, of Hamas, of Britain, of France, of Syria and of Lebanon. Qatar had the foresight to equip itself with an exceptional international political weapon: the most influential rolling news television channel in the Muslim world – Al Jazeera. It covers all the countries, except one… Qatar. And its level of disposal towards certain regimes often depends on the interests of the emir, as was illustrated by certain secret dispatches from Washington that were revealed by Wikileaks. In its strategy to win friends and gain influence, France seems to occupy a special place in the heart of the Qatari state. First of all, because the Qataris know it so well; its institutions, its political personnel, its companies, its strengths and weaknesses. A good number of them arrive on French shores every summer, fleeing the intense heat. Qatar just loves France and it loves it so much that it has decided to buy it… literally. It has decided to buy its political class, its large enterprises, its fiscal plans, its prestigious colleges, its property stock, its footballers… The strange thing is that it doesn’t seem to bother anyone in France, yet the links established in France by Qatar should perhaps be bothering the French. Because Qatar isn’t really a place that you want spend much time in. It’s an absolute monarchy based on revenue. There are no political parties and no democracy. The emir’s regime is still fragile, even if the so-called Arab Spring seems to have had no effect on it. It’s very difficult to get any information on what happened during the coup attempt of July 2009. It appears that high-ranking military officers allied to a “foreign power” were arrested before being able to put their coup plans into action. Doha is a case in point with regard to an attitude that is, at best, ambiguous towards Iranian Shiites or Sunnis. It’s the only Wahhabi country apart from Saudi Arabia. It’s a country where three quarters of its residents are non-nationals and where the Iranian, Shiite and Pakistani minorities or the immigrants from the other Arab states could one day rise up, take power and act for a foreign power. And so, Doha tries to play a very subtle diplomatic game consisting of keeping a foot in all camps at all times. In February 2010, Qatar is said to have signed a defensive pact with Syria and Iran while all the while maintaining an American military base on its soil since the First Gulf War. Qatar was, along with Syrian President Bashar el-Assad, the organiser of the triumphant visit of Iranian President Mahmoud Ahmadinejad to Lebanon in July 2010. The Qatari Emir went to Israel on a secret trip in March 2010. And still according to Wikileaks, Qatar has proven itself to be considerably lax concerning operations of financing of terrorism from its soil. All of this doesn’t stop the ranks of French politicians – both male and female – from queuing up to go to Qatar. A quick run-through of the list of the most regular visitors to Doha reveals household political names such as Dominique de Villepin, Bertrand Delanoë, Philippe Douste-Blazy, Rachida Dati, Ségolène Royal, Fadela Amara, Claude Guéant, Jean-Louis Debré, Gérard Larcher, Hubert Védrine, Frédéric Mitterrand, Hervé Morin, Jean-Pierre Chevènement, Dominique Baudis and Jack Lang. 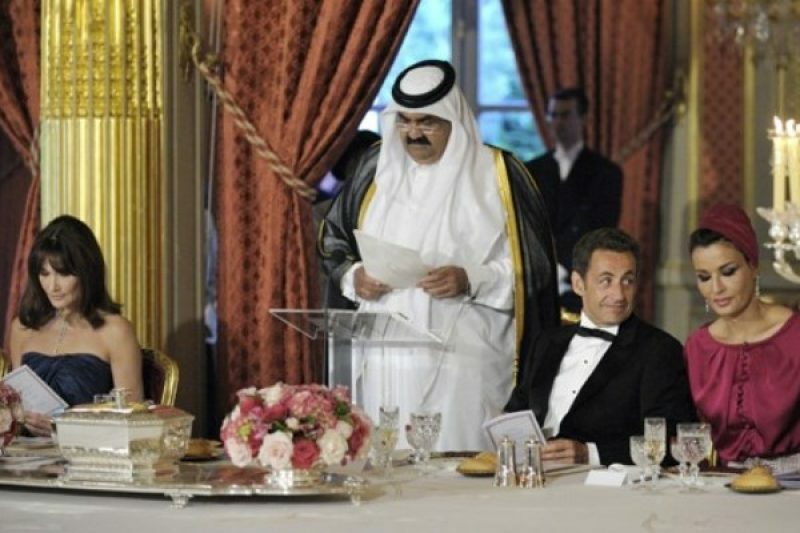 Three weeks after his election in 2007, the first Arab head of state that Nicolas Sarkozy received at the Elysée Palace was Hamad bin Khalifa al-Thani. A month and a half later on the 14th of July 2007, al-Thani was at the parade on the Champs-Elysées alongside the President of the Republic. The strong links forged by Nicolas Sarkozy with the Emir when he was Minister of the Interior and organising the training of Qatari law enforcement proved to fruitful. This was manifest in the determining role that Qatar played in the liberation in July 2007 of the Bulgarian nurses detained in Libya by Colonel Ghadafy and, more recently, by the symbolic participation of Qatar in the western military intervention against Colonel Ghadafy; the only Arab country to do so. Another example of the permanent double-game of Qatar was when the emirate also played a role in the Al-Megrahi affair; when one of the Lockerbie bombers (who has since died of cancer) was liberated in August 2009 for so-called medical reasons. Amongst the current and former members of government, Claude Guéant (special envoy of former president Nicolas Sarkozy), former Justice Minister Rachid Dati (whose sister works for the Procurer General of Qatar) and outspoken feminist politician Fadela Amara have all significantly increased the number of trips to the Emirate. At one point during her reign as Justice Minister, Rachid Dati was visiting Qatar up to two or three times a month. Sarkozy isn’t the only one the Qataris have been grooming. Those close to his predecessor Chirac (who made no fewer than 9 official visits to Doha), as well as members of the Socialist family have also benefited from their advances. Qatar is the star client of Dominique de Villepin’s law firm. The contract is said to stipulate that all journeys made to Doha by the former Prime Minister of the Chirac regime are to be made on Emirate aeroplanes. Socialist presidential candidate (from 2007) and estranged wife of current president François Hollande Ségolène Royal found herself being offered a dinner in her honour at the Qatari Embassy in March 2008. Another manifestation of the weight that the Emirate carries in French political life is the fact that it managed to get the Assembly and the Senate to pass a vote in 2008 that allows for a special fiscal status on its investments in France. 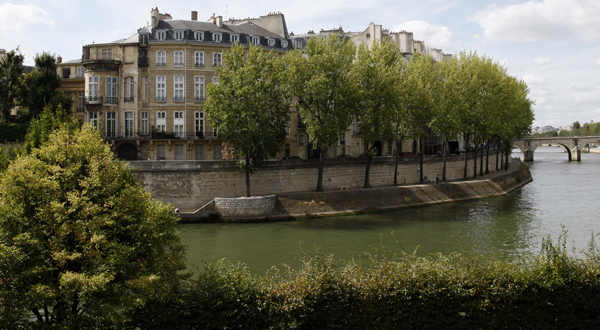 Property investments belonging to Qataris are not taxed on values added and Qatari residents in France don’t pay ISF (Impôt de Solidarité sur la Fortune – French wealth tax) for the first five years. The Qatar/France friendship group has 49 deputies in the National Assembly. Qatar has signed defence agreements with France that ensure the training of their military naval personnel and of its police force, as well as the supply of military hardware – most notably Mirage 2000 jet fighters. Qatar has either obtained or wants to obtain the opening of branches of some of Frances most prestigious schools of higher training, such as HEC, Saint-Cyr or the Ecole Nationale de la Magistrature. The big names in French industry are, of course, very much present in Doha – most notably in the areas of defence and energy: Total, GDF-Suez, EDF, Veolia, Vinci, Air Liquide, EADS, Technip… all have been signing important contracts. But Qatar is, above all, an investor. The sovereign fund of Qatar is a stakeholder or potential stakeholder in strategically important groups such as Lagardère (defence and press), Veolia (community services), Suez (energy), and Vinci (the world’s largest construction company). The drama that was played out a few months ago around Areva (nuclear energy) offers an interesting insight into the power and the ambition of the Qataris in France and the manner in which they proceed and how their networks operate. In this case, they played on the strong and well-established links between Claude Guéant (General Secretary at the Elysee Palace at the time), François Roussely (president of Crédit Suisse France) and Henri Proglio (CEO of EDF and close to Nicolas Sarkozy). These three men know each other very well. François Roussely preceded Claude Guéant as head of the Police Nationale and Henri Proglio as head of EDF. Roussely was commissioned by the government to publish a report on the future of nuclear energy and (something that didn’t raise any alarms) consult the Qatari sovereign fund The latter is a client and shareholder of Crédit Suisse and is extremely keen to get a hold of Areva capital. It necessitated the combined intervention of Prime Minister François Fillon, Economy Minister Christine Lagarde and Areva president Anne Lauvergeon at the end of 2010 to prevent the eventuality of Qatar gaining entry to the jewel in the crown of the French nuclear industry. The property market is another good barometer of Qatari influence. The Emir possesses a palace of 4,000m2 in Marnes-la-Coquette (Hauts-de-Seine department), as well as the Hôtel d’Evreux on the highly upmarket Place Vendôme in central Paris and two more private hotels attached. The sovereign fund owns two luxury hotels in Paris – namely the Majestic and the Royal Monceau. But it was the works of the Emir’s brother during the restoration of the Hotel Lambert (17th-century jewel, situated on the île Saint-Louis and bought in 2007 from the inheritors of Guy de Rotschild) that finally caused a few waves. A significant and illegal works scheme at the site caused a controversy. In order to bring the problem to a close, Christine Albanel – then Minister of Culture – did not call on the services of the National Commission for Historic Monuments, but rather a Scientific Committee that was created especially to deal with the problem. And, to finish, there is the sport of Association Football; which seems to be the ideal conduit through which it seems, Qatar will finally obtain the status and recognition that it so desperately seeks. The recruitment of French footballing hero Zinedine Zidane for several millions of euros in order to vaunt the merits of the candidature of Qatar as host country for the 2022 World Cup was surely a crowning achievement. This is the smallest ever country to organise a FIFA World Cup tournament. It’s also a country that never qualified for this competition and it is, most incredibly, a country whose climate is completely unsuitable for the playing of soccer in summer. The controversy that followed the heavy suspicions of FIFA corruption haven’t made any difference. After the United Kingdom, Germany has in turn questioned the choice of Qatar and is demanding that its candidature be re-examined. Not likely. The interests of Qatar in football don’t end with the organisation of the World Cup or with the purchase for its clubs of European players at kings’ ransoms who are otherwise at the end of their careers. The European clubs have also become prey: Malaga and Barecelona in Spain and now Paris-St-Germain – the only truly heavy-hitting soccer club in the French capital and of whom Nicolas Sarkozy is an avid supporter. It has been repeatedly pointed out that the Elysée has not spared its efforts in convincing the Emir to give PSG the means to take the club to a higher level. But for what in return? Aren’t all the rich countries at this sort of thing? Very interesting. We don’t often hear much about that side of French politics – more associated with what the Americans get up to. Football and Sepp Blatter – say no more.